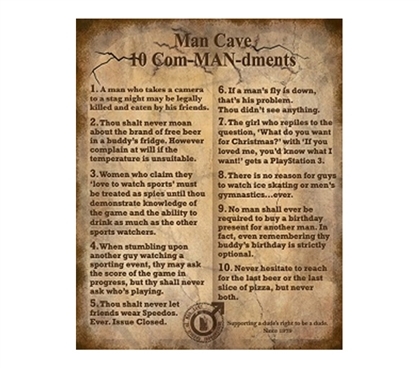 Our funny college tin sign of The 10 ComMANdments is a hilarious guys dorm decoration that essentially breaks down Guy Code in 10 simple rules -- or ComMANdments. Ranging from not allowing your friends to wear Speedos, to what to you should get your girlfriend for holidays, to even what you can and can't do when it comes to talking about sports, beer, and pizza, this dorm tin sign covers it all. It's definitely possible to turn your dorm room into a total man cave. That is, of course, if your roommate agrees. If he does, a college tin sign like this is the perfect dorm wall decor to take your dorm room from average to funny and chill for you and all of your guy friends.